After author Shannon Huffman Polson's parents are killed by a wild grizzly bear in Alaska's Arctic, her quest for healing is recounted with heartbreaking candor in North of Hope. Undergirded by her faith, Polson's expedition takes her through her through the wilds of her own grief as well as God's beautiful, yet wild and untamed creation--ultimately arriving at a place of unshaken hope. She travels from the suburbs of Seattle to the concert hall, performing Mozart's Requiem with the Seattle Symphony, to the wilderness of Alaska--where she retraces their final days along an Arctic river. This beautifully written book is for anyone who has experienced grief and is looking for new ways to understand overwhelming loss. Readers will find empathy and understanding through Polson's journey. North of Hope is also for those who love the outdoors and find solace and healing in nature, as they experience Alaska's wild Arctic through the author's travels. "Shannon Huffman Polson has written a soulful and brave book about death, life, and the complexities surrounding both. There is nothing sentimental in these pages. North of Hope shows us how personal loss and loss of our planet come from the same place: Love. This is a testament to deep change, human and wild." "Daring, perceptive, and eloquent--Polson's writing is clear and forceful. Like all true pilgrimages, this one is challenging, and well worth taking." "Polson's extraordinary journey draws you into the depths of anguish and brings you back out realizing that while not all things fractured can be healed, the soul will gravitate toward beauty, art, and meaning if guided in the right direction." 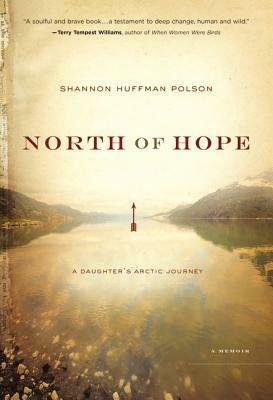 "North of Hope is an enthralling story of loss, courage, and redemption told by a gifted, original, and brave new voice, Shannon Huffman Polson." "Shannon Huffman Polson has written a book about loss that is both unique to her personal experience and universal to the human experience. She writes with clarity, honesty, and poise." "North of Hope, Shannon Polson's gripping account of the shattering, traumatic loss of her father, is a must read. It is a gift to everyone who reads this powerful, inspiring story." "North of Hope is a remarkable story about the power of the wilderness both to harm and to heal, and to provide strength and sustenance to the human spirit, no matter what the challenges."